One of the core virtues of any law firm or legal organization is the retention of crucial information. While the task or keeping track of large amounts of information can be daunting, it’s absolutely necessary. However, it can also be incredibly costly. After all, the amount of money your firm puts into storing these documents can rival the cost of housing a partner. When storing physical copies of documents such as printed contracts, client files and email copies, these documents are at risk for fires, floods and other disasters. Since the objective is to keep this confidential information safe, the logical solution would be go to paperless. Of course, some law firms already have so much paper stored away that that a document overhaul is too lengthy a process to undergo–but it really doesn’t have to be. The key to jumpstart your paperless efforts is to implement small, everyday changes than can set a foundation you can work with. Here’s how. Why Do Some Law Firms Fear the Paperless Process? So you’ve put off sorting through your vast collection of paper documents because the idea of even beginning to organize them feels scary. So, what do you do? You sit on these documents for years and continue to build on the mountain of storage. Before you tackle this overwhelming amount of paper, start with some simple changes that will ease your transition into going paperless. Set an end-date for your storage: The first step towards jump-starting your paperless efforts is to decide when to stop contributing to your physical storage files. Choosing an end-date will help prevent further build-up of records. Per your certain federal and state retention guidelines, there may be circumstances where storing paper copies of documents is legally necessary. Use your judgement (and the law) when deciding what gets added to your file storage. Practice the art of scanning: Once you’ve established an end-date for your physical document storage, it’s time to get to scanning. Implement a scanning rule in your office for all applicable documents–this means that every document that can be scanned and saved onto your company’s network drive/computer, should be. By limiting the amount of paper that goes into storage, you’ll essentially be capping on the amount of paper you’re storing, which will make the “clean-up” process that much easier. Eliminate the constant fetching of documents: Most law firms have experienced the back-and-forth of fetching a document that must be altered or reviewed. Sometimes, these documents may be lost in a sea of files. 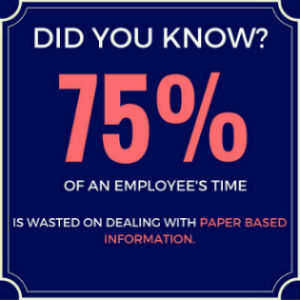 The average office spends about 400 hours a week searching for misplaced documents, which cuts into time that could be used more productively. Once you start scanning most of your documents, the need to travel offsite (or into that one room packed with file boxes) to retrieve a document will be a thing of the past. Now that you’re on the right path towards maintaining a paperless law firm, it’s time to decide what to do with your current file storage. The answer is easy: digitize them. At Document Scanning Services LLC, our Ft.Lauderdale document scanning services also assist law firms nationwide. The process is simple: just provide us with what you want scanned and we’ll take care of the rest. We’ll even take care of document destruction once scanning is complete. Because law firms require documents to be organized and ready to retrieve at any time, we also offer document indexing services to help you locate your documents quickly and efficiently. Want to learn more about the document scanning process and how we can help you improve the quality of your law firm’s document retention? Call us today at 954-271-0118 for a free scanning quote. 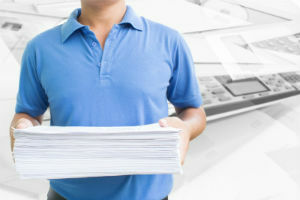 Document Retention Guidelines: Should You Save it or Shred it?